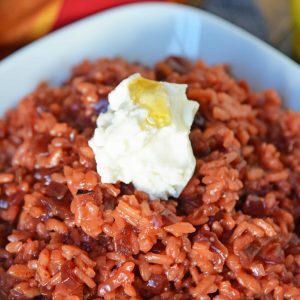 Beet Risotto is an easy risotto recipe that uses beets, shallots and garlic for a vibrant dish. Top with cool ricotta and honey. Scrub beets clean and then place them in a saucepan fitted with a steamer basket and about 2 inches of water. Cover and cook for about 30 minutes or until tender all the way through. Once the beets are cool enough to handle, rub the skins off and cut into small bite size pieces. In a large, wide frying pan, heat 1 tablespoon butter and olive oil, sweat shallots and garlic until just soft. Add dry arborio rice, continuing to brown. Add half the chopped beets. Meanwhile, heat vegetable broth in a sauce pan until at a low simmer, then reduce to warm. Add white wine to arborio rice, stirring to absorb. Ladle in one cup of simmering broth and stir. Cook until absorbed. Continue to add 1 cup of simmering broth at a time, waiting until each addition is absorbed before adding the next, until all broth is gone. This process takes about 20 minutes. Risotto should be creamy and rice granules taunt. Stir in salt and remaining beets. Spoon into serving bowls, top with a dollop of ricotta cheese and drizzle lightly with honey. If you've tried this recipe come back and let us know how it was!